Check the Fien Print: MovieWatch: "Sweeney Todd: The Demon Barber of Fleet Street"
MovieWatch: "Sweeney Todd: The Demon Barber of Fleet Street"
I'm not going to name names, because that would be rude, but when I was a freshman and sophomore in high school, there was an upper classman who was the bee's knees when it came to the theater department. He had the lead in all the plays, which was appropriate because he was a pretty solid actor, particularly by the standards of your basic high school play. But in addition to doing one big play each year, we also did one big musical each year and as inevitably as the play lead would go to this one guy, he'd also get to topline the musical. The problem? As solid as his acting was, he couldn't sing. At all. He couldn't carry a tune or hit a note or stay on rhythm. Knowing both the available lead and his limitations, the theater advisor attempted to choose musicals in which the main role didn't require vocal chops, something like "The Music Man," where you can talk your way through all of the songs. I kept thinking of this former classmate of mine as I watched Tim Burton's "Sweeney Todd" on Tuesday night as part of my family's obligatory movie-and-Chinese Christmas. 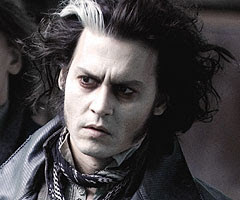 Unlike my former classmate, "Sweeney Todd" leading man Johnny Depp is capable of carrying a tune. Don't get me wrong. However, unlike "The Music Man," "Sweeney Todd" is a show that requires more than just staying on beat. Stephen Sondheim musicals present particular challenges and Depp is, alas, up to none of them. His vocal failings and the even more grating failings of co-star Helena Bonham Carter contribute majorly to the disappointment I felt watching "Sweeney Todd," but they really weren't the only ones. I'm usually capable of making exceptions when actors can do one thing required for a role and not others. I, for example, think that Kevin Costner is good in both "13 Days" and "JFK" despite the fact that he cannot do Boston or Southern accents and his tin-ear occasionally hurts. I just happen to think there's more to what he does in those movies. With Depp in "Sweeney Todd," it's one thing that the melody of every song has been clipped because his range is mighty limited. He barks out every line in the same gruff brogue, all in a three or four note range. Because he's talking through most of the songs, he keeps his British accent intact (more than, say, [the far more melodically gifted] John Travolta singing in "Hairspray" can say) and between the accent and the necessary over-production of his vocals, many of the words get muffled as well. So if you have a leading man who causes the melodies to be trimmed and causes the words to be lost, what business does he have a Sondheim musical? None, I'd say. To make matters worse, Depp never changes his expression the entire movie. I get it. Sweeney Todd is miserable and vengeance only makes him less happy. But I've seen Depp do Kabuki-painted sorrow before in Tim Burton movies and Edward Scissorhands was a character with much more variation And how much of Depp's performance comes courtesy of that make-up anyway? The hair, the costumes, the make-up? It's a mighty superficial turn. Depp is so unremittingly morose that he at least makes Carter look like she's committed to a well-rounded performance, even though she's essentially mixed Bellatrix Lestrange with just a dash of Marla from "Fight Club" and called it a day. While Depp's voice is negligible, but not tin-eared, Carter just mewls in the same high pitched voice, only occasionally finding the tune. And Mrs. Lovett is a part that has drawn Broadway legends including Angela Lansbury and Patti LuPone. Singing really isn't optional. Look, I'm not going to say that Carter -- a perfectly talented actress, don't get me wrong -- doesn't find a few emotional grace notes in the movie's final act, but if she can't sing the part, she isn't doing the job. The funny part is that there are people in the cast who *can* sing. Basically, if you recognize the actor, their voice is at best limited. If the actor is somebody you've never seen before, they'll be able to sing. So Jamie Campbell Bower, Laura Michelle Kelly, Jayne Wisener and Ed Sanders, the film's younger and less known stars, all have strong voices and one can only imagine the production chores necessary to blend the on-pitch stars with Carter or Depp on several duets. I'd blame Depp and Carter more, but Burton made his own bed here and he almost seems to be using the limitations of his actors as an excuse to limit himself. After one glorious effects shot in which the camera zips from the harbor through London to Lovett's Pie Shop, Burton mostly keeps his more flamboyant tendencies in check, resulting in a might claustrophobic movie. There's virtually no choreography for the actors and the camera work and editing are also needlessly restrained. With the exception of "By the Sea," Burton and DP Dariusz Wolski's color scheme is unremittingly and dully dark. The splashes of blood are supposed to provide variation, but once you've seen seven or eight spurts of arterial blood, haven't you seen them all? Burton seems to be convinced that viewers will continue to either be amused or discussed by the same throat-slashing effects and the same body dumping shot every time, but I grew bored quite rapidly. I wonder why Burton didn't approach SFX and make-up master Greg Nicotero to deliver some original and varied throat slashing. It really might have made a big different. Even production director Dante Ferretti, one of my absolute favorite talents, is working on utter autopilot with his limited London cityscapes and miniature-laden skylines. Since this is the sort of thing Ferretti does in his sleep, maybe somebody else should have been handed the job for more inspiration. "Sweeney Todd" isn't a boring musical. It's mighty gloomy, but it has Sondheim's wit throughout and it actually had romance if done properly. Burton's interpretation, for my money, was wrong on most every level. I've gotta put this one down as one of my bigger disappointments of the year. Now, not to name names either, but you are talking about B.B., right? Agreed, mostly. But I found the camera-through-the-streets shot incredibly distracting, regardless of how impressive it was. Especially when the bulk of the remainder of the film proved to be so closed in. Jamie -- Not to name any names indeed, but yes. You are, of course, correct sir! I knew! I knew you were talking about BB! As stage crew we used to count the beats off stage for him...now that's saying something! And Dan, as always, I start out really liking a movie, then I read your review and am forced to stop and say, "Sh*t! I hate it when he's right!" Love ya for keeping it real!